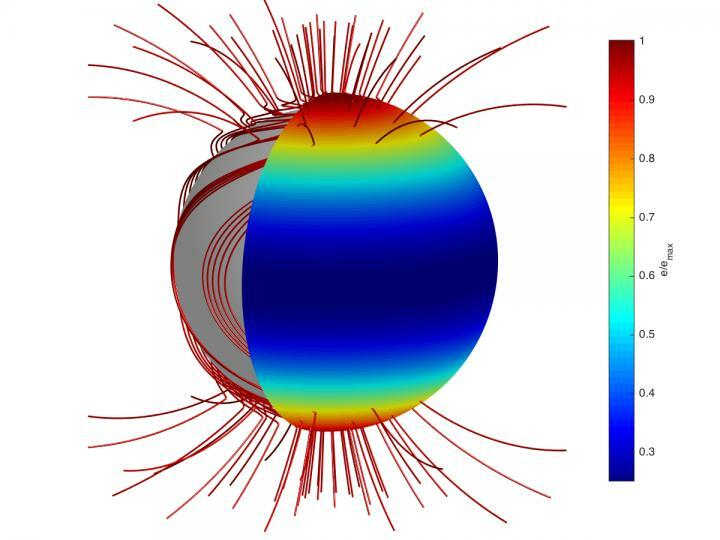 A study of the evolution of magnetic fields inside neutron stars shows that instabilities can create intense magnetic hot spots that survive for millions of years, even after the star's overall magnetic field has decayed significantly. The results will be presented by Dr Konstantinos Gourgouliatos of Durham University at the European Week of Astronomy and Space Science (EWASS) in Liverpool on Wednesday, 4th April. When a massive star consumes its nuclear fuel and collapses under its own gravity in a supernova explosion, it can result in a neutron star. These very dense objects have a radius of about 10 kilometres and yet are 1.5 times more massive than the Sun. They have very strong magnetic fields and are rapid rotators, with some neutron stars spinning more than 100 times per second round their axis. Neutron stars are typically modelled with a magnetic field that has a north and south magnetic pole, like the Earth's. However, a simple 'dipole' model does not explain puzzling aspects of neutron stars, such as why some parts of their surface are much hotter than their average temperature. Gourgouliatos explains: "A newborn neutron star does not rotate uniformly – various parts of it spin with different speeds. This winds up and stretches the magnetic field inside the star in a way that resembles a tight ball of yarn. Through the computer simulations, we found that a highly wound magnetic field is unstable. It spontaneously generates knots, which emerge from the surface of the neutron star and form spots where the magnetic field is much stronger than the large-scale field. These magnetic spots produce strong electric currents, which eventually release heat, in the same way heat is produced when an electric current flows in a resistor." Fig. 1. A tightly wound-up magnetic field used as initial state in the simulation. Fig. 2. The magnetic field structure after it has become unstable leading to the formation of knots and magnetic spots. Ranked fourth in the UK in the Guardian University Guide 2018 and fifth in the 2018 Times and Sunday Times Good University Guide. A member of the Russell Group of leading research-intensive UK universities. Research at Durham shapes local, national and international agendas, and directly informs the teaching of our students. Ranked the world top 40 globally for the employability of its students by blue-chip companies world-wide (QS World University Rankings 2017/18). Highest rate of employment and further study in the UK for undergraduates completing their first degree (Higher Education Statistics Agency 2017/18).